It’s time to pray for west winds and hit the beach as cobia will be invading our nearshore waters. Hit the beach when the sun is up and watch for cobia piggy backing on Manta rays as long as water temps stay in their comfort zone (68-72). Unpressured cobia will eat just about anything (flies to plugs) but for picky eaters keep some live bait (pogies, mullet, shrimp or even mud minnows) handy and ready to fire. Fishing at first light or last light still proves to be successful with topwater plugs. Rapala Skitter Walks, Top Dogs and Zara spooks are top water lures that has proved to be the gator trout lures of choice along with any kind of popper top water for those that cannot “walk the dog”. When the topwater bite tapers off go for subsurface suspending baits like a Sebile Magic Swimmer or lipped diving plugs worked with a stop and go retrieve. Live shrimp and a bb split shot tossed up current along the ICW will produce trout for live bait fisherman. 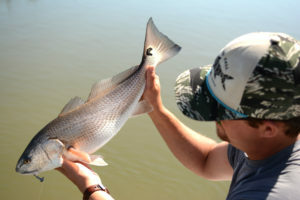 Redfish continue to shadow mullet seeking refuge on top of oyster beds and will be fooled by Fishbites Extreme jerk baits, gold spoons and a Sebile Stick Shadd. 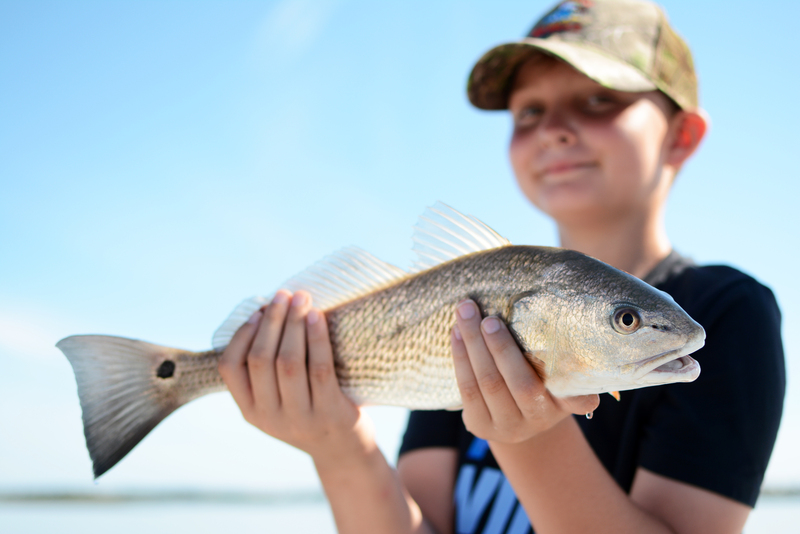 Bouncing jigs with shrimp or mud minnows around oyster beds will also produce good catches of reds and flounder. 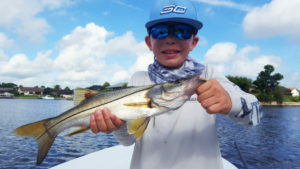 Slot snook are starting to show up this month, local bridges, docks and seawalls fished at night will produce linesiders. Live select shrimp, pinfish and lipped diving plugs are local favorites when chasing snook but remember to use a minimum of 30lb. leaders to avoid cut offs. 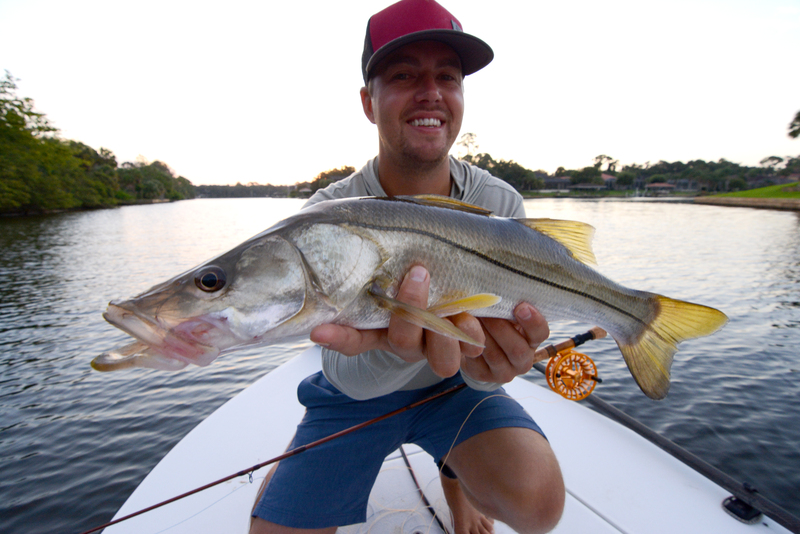 Topwater enthusiast can also trick snook into biting at first light off the ICW where bait is available. Inlets and nearby creeks with drop offs will hold flatties and doormats waiting to eat a live mullet on a fish finder rig or mud minnow pinned on a jig head. Best tides or during change of tides at area inlets or outgoing tides at creek mouths. For shallow water flounder try a Slayer Inc. spinner baits or inline spinners. Spanish Mackerel, blues and jacks will invade our near coastal waters just outside of Matanzas Inlet, proven techniques for Spanish is to slow troll spoons or look for acres size schools chasing bait on the surface. It’s a great time to grab a fly rod and practice catching as spanish mackerel or ferocious eaters. Get your medium heavy rods ready as the flounder are coming! 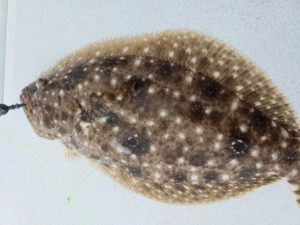 Its that time of year where water temps dropping to 68 degrees will trigger the fall flounder run as they make there mass exodus out of our passes looking to spawn offshore. Last of the outgoing tide with live mullet or mud minnows will be your best bet for that doormat flounder. 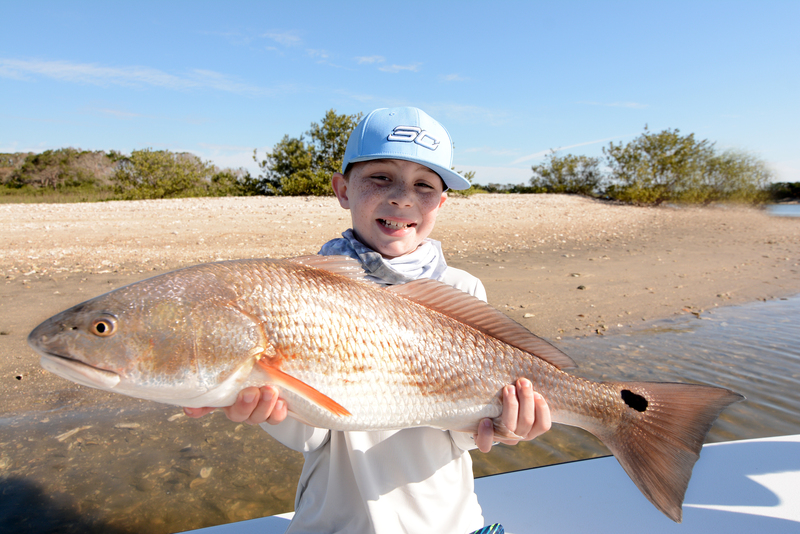 Best places to fish are at your local inlet as the “bottle neck” limits the amount of area needed to cover. I look for sandy bottom adjacent to rocks and slowly bump my baits in constant contact with the bottom waiting to feel a bump or some weight. Once I feel a thump I give a little slack and start the waiting game. Flounder have a tendency of holding on t0 your offering before inhaling it. I typically give it about a minute before setting the hook unless the flounder starts to swim off then I set it right away. Southern flounder are typically the most abundant type of flounder in our area but we do get gulf flounder and summer flounder as well. You can tell the difference by coloration, spots and size. Here is a photo of a gulf flounder who found my mud minnow and jig head combo. 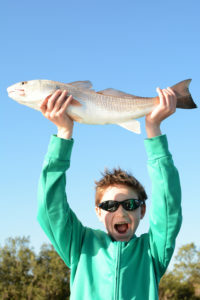 Redfish also share the same area so its not uncommon to go flounder fishing and end up redfishing. The mullet are here!!!!! Some of the best fishing of the year can be had during the fall mullet run where million and millions of bait fish migrate their way back south and offshore to spawn. This type of bait run brings out all the predators to gorge themselves into food coma. The mullet will make their way down the ICW and beach which gives anyone an opportunity to catch fish whether by boat or land. Common species found mixed with the mullet are redfish, trout, snook, tarpon, flounder, jacks and sharks. The best bait to fish with is obviously mullet but artificial fisherman can use any lure that mimics a mullet. Some of my favorite type of fishing is using a topwater plug during low light conditions. Where I fish is chosen for the species I am after. If snook fishing I concentrate around the residential canals targeting seawalls, docks and rip rap. Redifsh are found on the flats, docks and especially at the inlets and beaches. Tarpon are loaded up on the area inlets especially if the big mullet are around if not look off the beach. Rigs for fishing live mullet depends on structure and water depth. Some of my favorite setups are live lining a mullet with a hook in its back and a fish finder rig. I use a free lined mullet when targeting tarpon on open water or pitching to shallow docks. Fish finder rigs I use when fishing deep water structure for flounder and redfish. The summer bite continues to be hot like the temperature but that is why we start early. Early risers not only beat the heat but take advantage of the first light feeders. Schools of jacks are seen cruising shorelines eating everything in their path! 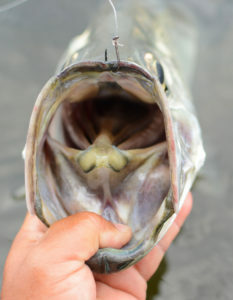 Topwater, soft plastics or live bait will all get a line tight as the schools of jacks pass by. First light feeders also include tarpon! Whether you chose to fish for the juvenile or fully grown tarpon, first light is most productive especially inshore. Beach tarpon are at peak right now as they are seen crashing in the pogie pods along the beach. Early morning for redfish also means topwater explosion time! Walking the dog action on topwater plugs is a great way to find redfish on the flats. The click clack sound and motion make it almost irresistible for redfish and other species like trout and snook. Last chance fishing before heading back to school has been nothing short of great! 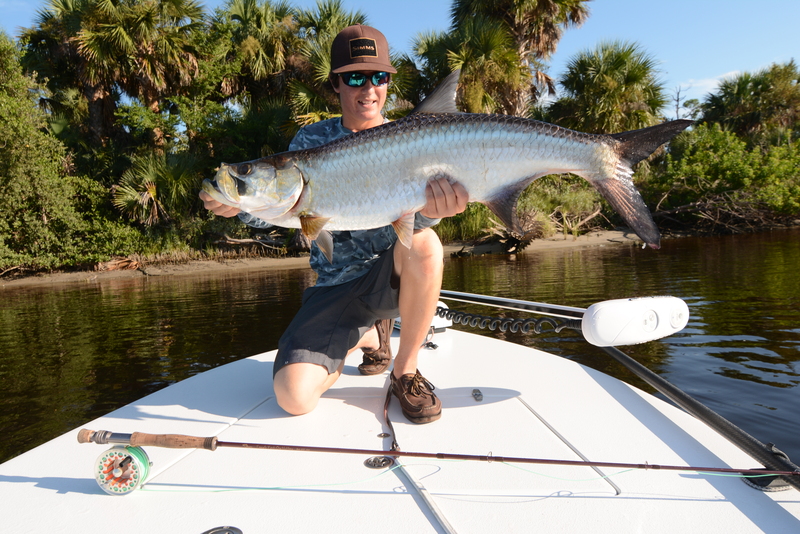 Tarpon, redfish, snook and jacks have been our targeted species and they all have been eating good. From 10 pounders to 150 pounders the tarpon bite has been explosive at first light. Low tide has been keeping us busy seeing redfish and catching them, from artificial lures to bait fishing they have been eating it all. Jr. Dant is shown here with one of his few snook he caught this day. Tarpon come in all sizes from 2lbs. to 200lbs. but my favorite are the 20 lbers that are targeted on fly or light tackle. 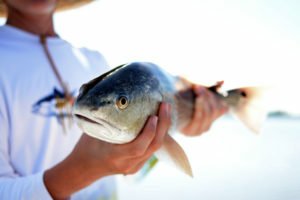 Palm Coast host a great juvenile tarpon fishery in the summer months. Call today to book your chance at the silver king. Summer time and the heat is here along with a good early morning bite. Early morning starts from Bings Landing has us fishing the cooler part of the day and typically best time as the fish are waking up for breakfast. 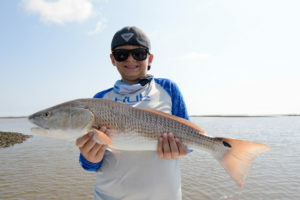 Our morning start has been fishing the shallow flats for redfish with topwater plugs or live bait which it all depends on anglers skill level. As the sun rises we start fishing a bit deeper for redfish and flounder or hit the beach for tarpon. Tarpon have been crashing the pogie pods at first light right off our beaches. 80-130lb tarpon are about the average size and will test your stamina. Other fish being caught are big jacks, sharks and king fish. 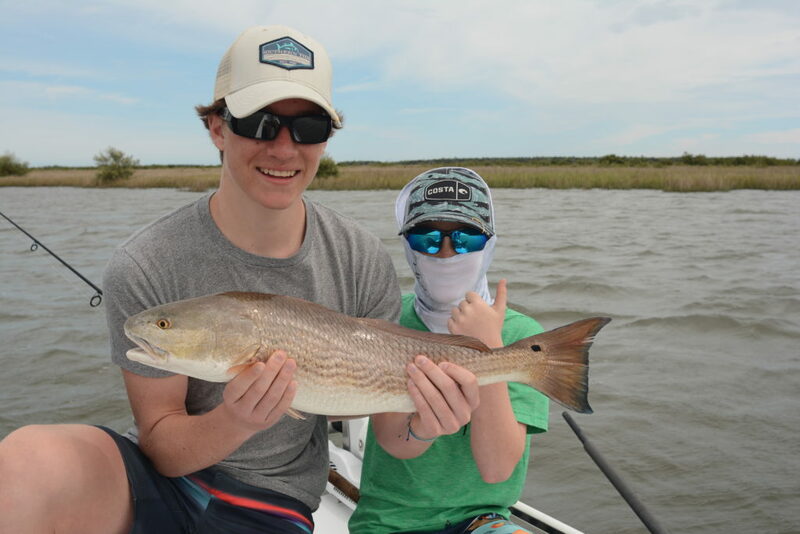 Summer vacation is in full swing in Palm Coast and my anglers are catching! 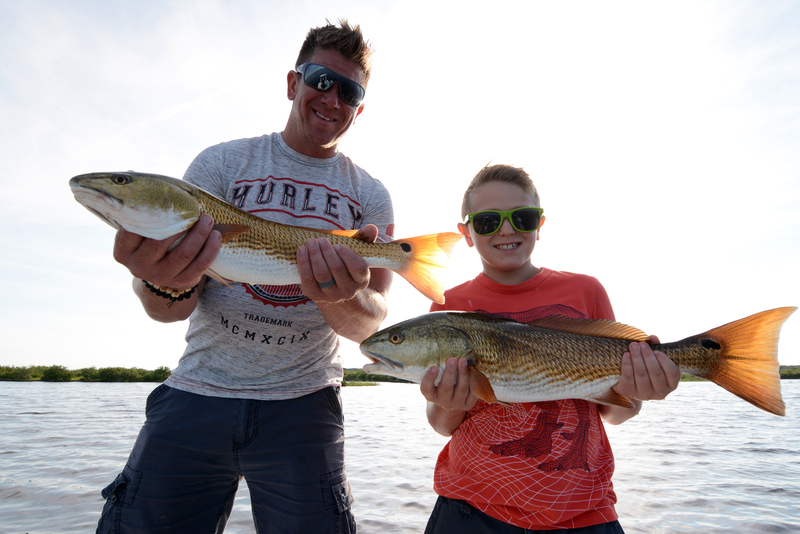 Fantastic redfish bite last few weeks as we head out at first light to picturesque and tranquil flats in search of red drum. We have been catching them on topwater plugs, soft plastics and live bait like shrimp and mullet. Tarpon fishing has just kicked off and we are throttle down! From the little ones to fully grown ones we are getting shots at hungry fish that are willing to test your tackle and stamina. 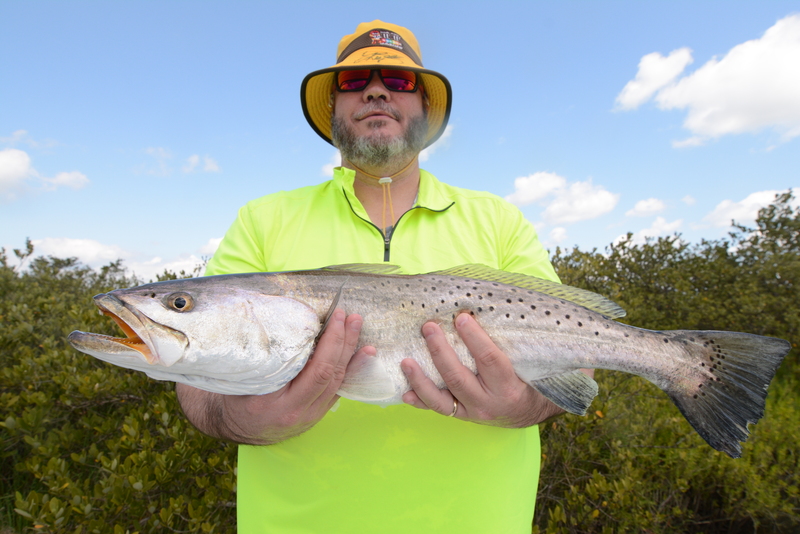 The last half of April has proven to be the BIG GATOR TROUT time in the marshes of Palm Coast. Catching the right tide with the right bait and presentation has lead to my clients catching their all time personal best trout just about every single charter. Most importantly we have released every gator trout for someone else to enjoy and hopefully released as well. 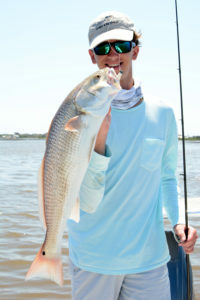 The redfish bite has been great as well as my clients have enjoyed catching them in the shallows or in the deep water. 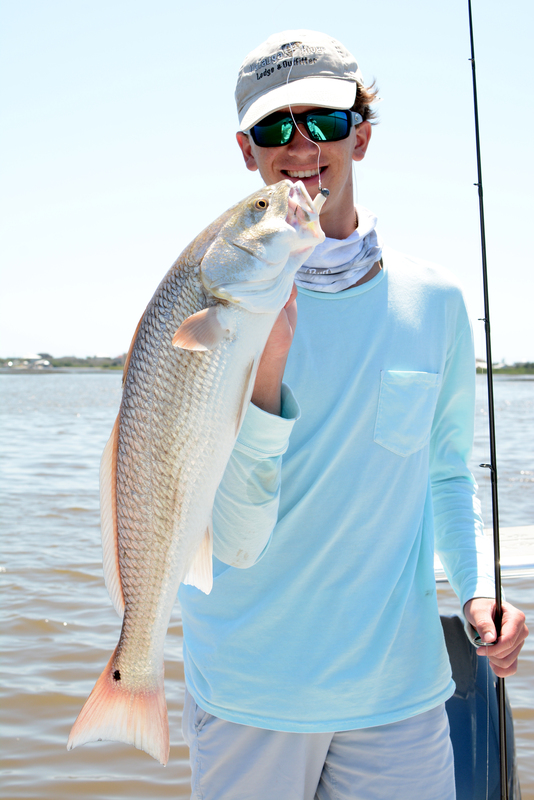 When you fish the right tide with the right bait you can expect to get into the redfish as this is catching time. 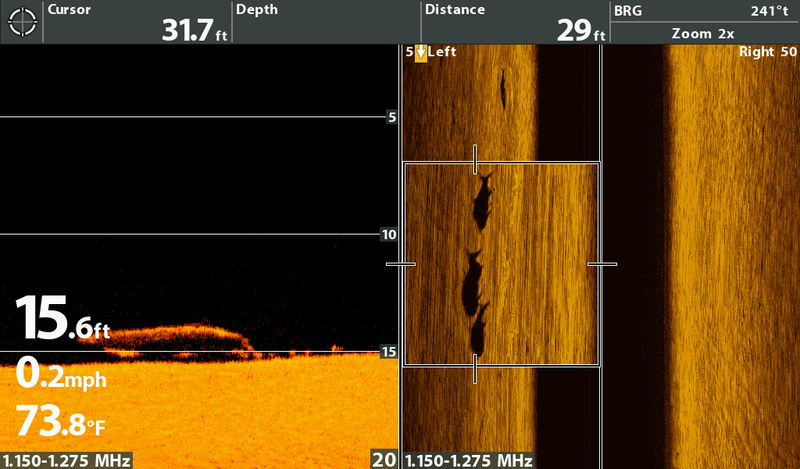 My new Hummingbird Helix 10 si mega has really helped me find fish I normally would pass up in the deep water. 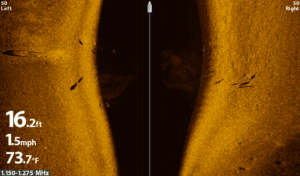 The capabilities of this side imaging unit is what we call a “game changer”. 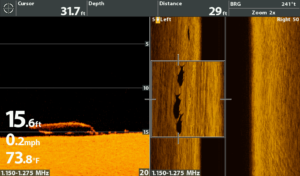 Being able to cruise the ICW and see 50 ft or more to the sides of the skiff scanning water for schools of has been nothing short of amazing and now a must have for fisherman. 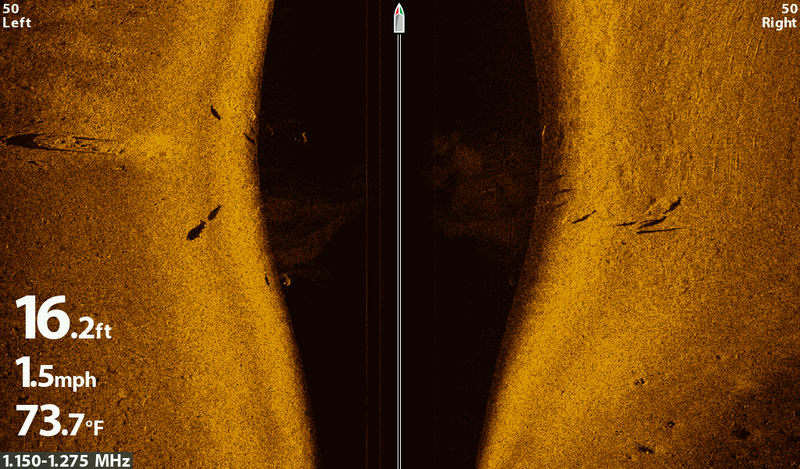 here are a couple of sample screen images I was able to save while scanning for fish. In this screen capture you can see 3 fish swimming together. not only can you see some fish in this picture but look at the small sunken boat on the left. Fishing has been nothing short of fantastic for my spring breaker this past week in Palm Coast! Plenty of redfish and trout have kept the kids busy and grunting trying to reel them in and hold them for their photos. 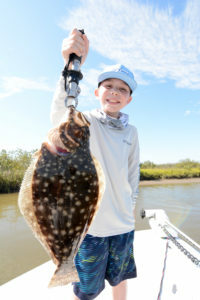 Smiles all around and bragging rights as most kids have been catching the majority of the fish.